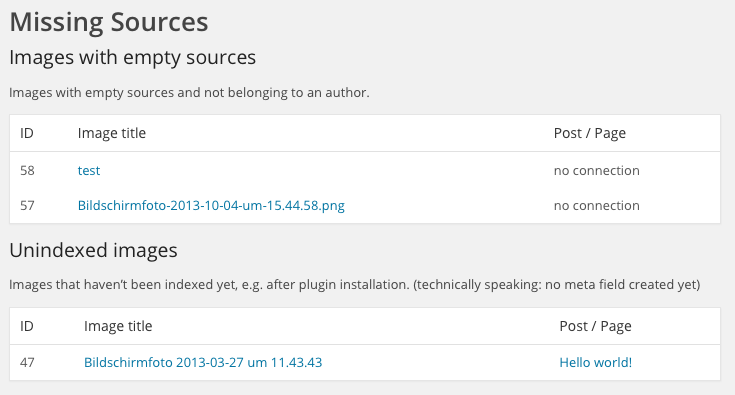 You can find a list of images with missing image sources under Media > Missing Sources. There you should see a list with images without information about the source. This list contains the title of the image and the post it is attached to. Click the image title to reach the edit page for the image. Here you find images to which no source was created yet. The methods here are for experienced users who want to find out why some images don’t have sources or some other part of the plugin seems to create errors.